Artist's illustration of NASA's Cassini spacecraft at Saturn. NASA's Cassini probe has begun reshaping its orbit around Saturn in preparation for the spacecraft's "grand finale" at the ringed planet next year. Cassini performed a 35-second engine burn on Saturday (Jan. 23) to set up an orbit-changing Feb. 1 flyby of Saturn's huge moon Titan. It was the second of five such burns Cassini will conduct, all of which will be followed by a close encounter with Titan. The Jan. 23 burn changed Cassini's velocity by 22.3 feet (6.8 meters) per second, whereas the Feb. 1 Titan flyby will adjust the probe's speed by 2,539 feet (774 m) per second, NASA officials said. The first engine firing occurred on Dec. 30, which set up a Jan. 15 Titan flyby. The next burn is planned for March 25, with the subsequent Titan encounter occurring on April 4, NASA officials said. The overall goal of these maneuvers is to get Cassini to a higher plane above Saturn's equator, which the probe has been circling since 2015. "By late November, the spacecraft will be on a path that will carry it high above Saturn's poles, approaching just outside the planet's main rings — a period the mission team calls the 'F-ring orbits,'" NASA officials wrote in the same statement. "After 20 F-ring orbits, Cassini will begin its Grand Finale event, in which the spacecraft will pass 22 times between the innermost rings and the planet before plunging into Saturn's atmosphere to end its journey on Sept. 15, 2017." 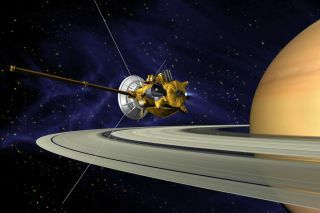 The $3.2 billion Cassini mission, a joint effort involving NASA, the European Space Agency and the Italian Space Agency, launched in 1997 and arrived in the Saturn system in 2004. In addition to its own science work, Cassini delivered a piggyback probe called Huygens onto Titan's surface in January 2005. Cassini has returned countless spectacular images of Saturn and its moons, and it has made a number of important discoveries. For example, in 2005, the spacecraft spotted geysers of water ice blasting from the south pole of the Saturn moon Enceladus. Cassini has flown through the plume generated by these geysers and found carbon-containing organic molecules — the building blocks of life as we know it — within it. The mission's home stretch should be productive as well, Cassini team members said. "We have an exciting year of Saturn science planned as we head for higher ground. And the views along the way should be spectacular," Cassini project scientist Linda Spilker, also of JPL, said in the same statement.